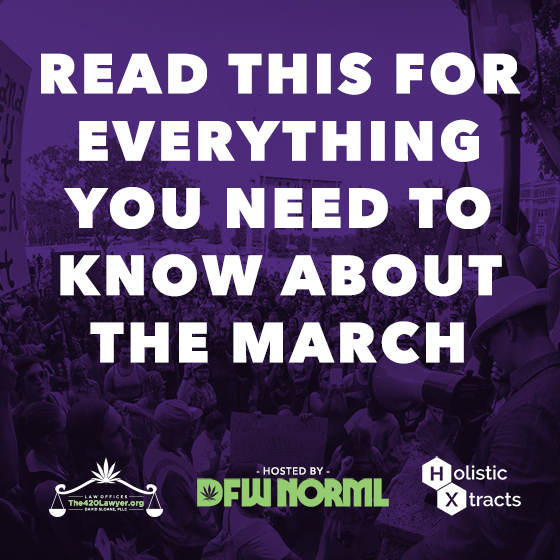 Read this page for everything you need to know about the 2018 DFW Marijuana March at Burnett Park in Fort Worth on Saturday May 12, 2018. ADDRESS: Burnett Park is located at 501 W 7th St, Fort Worth, TX 76102. WHAT TO BRING: Cash for parking and vendor booths, water bottles, sunscreen, hats, bug spray, signs, flags, backpacks, fanny packs, walking shoes, snacks, medications, sunglasses, personal fans, small ice chests and blankets to sit on. Kids are welcome. Dogs on leashes are welcome, but please clean up after them. RESTROOMS Located on the corner of 10th St. and Lamar St.
HANDICAP ACCESSIBILITY: Ramps are located on the corner of West 7th and Lamar St, as well as on 10th near Burnett St.
POLICE: Do not be alarmed when you see officers from the Fort Worth Police Department around the park! The DFW Marijuana March is made possible every year thanks to the respectful cooperation of the Fort Worth Police Department, so say hello and thank them for providing security for our free speech event. AFTER PARTY: Join us for a free after party from 7-9pm at Mercado Plaza located at 1426 N Main St, Fort Worth, 76164 next door to Lucky Horseshoe Tattoo. Live music performances by Chief Greenbud and Max Random. 1) Visit the Voter Registration table to get registered to vote. 2) Watch our 15+ inspirational speakers throughout the day, including doctors, educators, religious leaders, and pro-cannabis candidates for office. 3) Visit the DFW NORML table to meet our volunteers, become a member, and to browse our available merchandise including custom t-shirt printing, gold marijuana leaf lapel pins, buttons, wristbands, lighters, and stickers. Be sure to fill out a postcard while there, which we will mail to your elected representatives. 4) Check out all of our food trucks and vendors, including our Platinum Event Sponsors: The Law Offices of David Sloane and Holistic Xtracts. 5) Post photos and videos throughout the day using #dfwmjmarch. Then, at 4:20pm, while we are on the steps of the Tarrant County Courthouse, go live with Facebook Live, using the headline “Live from the DFW Marijuana March.” Help us flood social media for thirty minutes with our message of marijuana law reform! 6) Contact your lawmaker by phone from the event and leave a message using the sample script below. Not sure who represents you? Google “Who Represents Me” or visit www.fyi.legis.state.tx.us and type in your address, city, state and zip code. Look for the “Phone” or “Capitol Phone” for your Texas State Senator and State Representative. 7) Sign up for text alerts from DFW NORML by texting DFWNORML to 41411. 8) Meet new friends! Introduce yourself to the likeminded people in attendance, as well as our DFW NORML event staff and all of our inspirational speakers.